While uncertainty abounds on the details of the healthcare plans under the current administration and Congress, the trends toward value-based reimbursement are apparent. Successful organizations that break through the value barrier must have a strong vision backed by a unified leadership team, well-trained and motivated employees, and efficient work processes that eliminate duplication of effort. 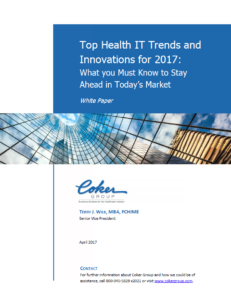 This paper highlights key health information technology (IT) trends and innovations that Chief Information Officers (CIOs) and other health leaders must know as we quickly progress through 2017. By understanding some of the important health IT innovations and trends, CIOs and other executives can better position themselves to adopt one or more of these advances to help transition their organizations toward high-value care.